Kintyre ferry Isle of Cumbrae inbound on service 27 September 2016. 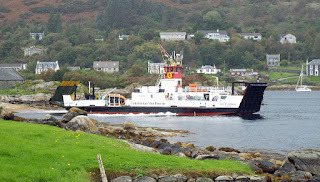 Leaving Tarbert on the return. Irrespective of Penelope Keith's ideas, Isle of Cumbrae does not service Gigha!